Get the Ground Breaking Book Today! Business leaders are voicing the cry “IT must Partner with the business”. They know they must move their companies move beyond simple alignment toward true business and technology convergence- that sweet spot where IT and business units are so strategically intertwined they operate almost interchangeably, outperforming their competitors as a result. Still, studies show 70% of business stakeholders don’t view the IT department as trusted partners or strategic collaborators. 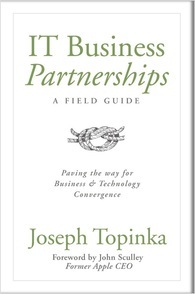 Seeing so much research about the need for convergence but so little written about how to achieve it, Joe Topinka wrote IT Business Partners: A Field Guide as a method to actually do what many business leaders are only buzzing about. As a career CIO and founder of CIO Mentor he draws on his own experiences implementing IT Business Partnership Programs to present an actionable, how-to field guide that enables true business technology convergence. IT Business Partners: A Field Guide provides an actionable plan to implementing IT Business Partnership Programs as a proven method of achieving business technology convergence. Contact us for bulk orders at info@ciomentor.com or call us at 612-910-6766. "...What I particularly like about Joe Topinka’s approach is it fits perfectly into the project team strategy that companies are finding to be the most productive way to work cross-functionally and with outside-the-company business partners..."